I adore pasta + I love food that makes for a cool presentation, so today’s recipe is one that I’m so excited to share! I’m sure many of you have had baked ziti/rigatoni before, BUT have you ever had a version that’s shaped like a pie? Basically, you place cooked rigatoni vertically into a springform pan (pictured below), then top it with a layer of ricotta, a layer of homemade meat sauce, grated mozzarella + parmesan, + bake until it reaches bubbly perfection. Sounds good, right? While this meal is definitely tasty, this is really a dish that’s first + firemost about the presentation. The awesomeness comes when you release the sides of the springform pan, reveal a fabulous rigatoni “pie,” + proceed to cut a perfect slice from it. And the flavor? I worried that with such a cool presentation, the flavor might be so-so, but this was actually quite delicious! Although, in my book, you really can’t go wrong with any meal that involves lots of pasta, tons of cheese, + a wonderful, savory sauce. 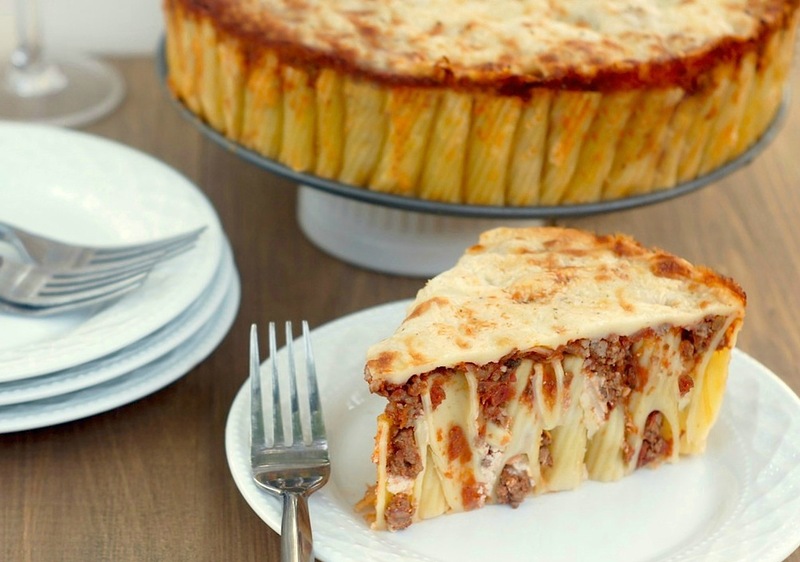 So, next time you’re looking for a dinner that can feed a crowd AND also has a major wow factor, look no further + give this amazing rigatoni pie a try! bring a large pot of salted water to a boil. add the rigatoni + cook until just al dente, according to the package instructions. drain + transfer to a large bowl. stir in 1 tbsp of olive oil + set aside to let cool, while you go on to the next steps. meanwhile, heat a large skillet over medium heat. add the beef + cook until it is no longer pink. drain the meat well + return to the skillet. stir in the crushed tomatoes, red wine, worcestershire sauce, parsley, basil, garlic powder, oregano + red pepper flakes. season with salt + pepper to taste. reduce the heat to low + simmer for 20 minutes, stirring occasionally. remove about 1/4 of the sauce + put aside in a small bowl – this will be your extra sauce for serving. preheat the oven to 400 degrees. grease or butter a 9″ springform pan. gently stir 1 cup of grated parmesan cheese into the cooked rigatoni until well-coated. 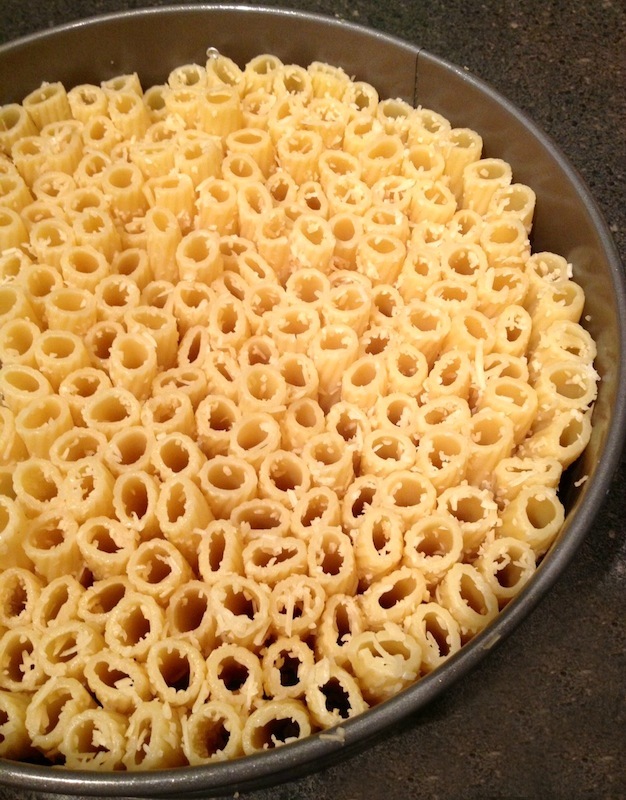 stand each piece of rigatoni up vertically in the prepared springform pan. (note: this step took me about 8 minutes). this is what this step will look like when done! once all the rigtoni is packed vertically into the pan, gently spread the ricotta cheese on top of the rigatoni in a thin, even layer. carefully pour the meat sauce in the skillet (not the reserved sauce) over the rigatoni. this is the most time-consuming part: with clean hands, use your fingers to carefully push the meat sauce down into the rigatoni. as you push the meat sauce down, you will also push the ricotta cheese into the rigatoni, which will help keep this dish from being dry. the more time you spend on this step, the better results you will obtain! (note: this step took me about 10 minutes). set the springform pan on a baking sheet + bake for 15 minutes. remove from the oven. sprinkle the mozzarella cheese + 1/2 cup parmesan cheese evenly over the top. cook for another 15 minutes, until the cheese is lightly browned + bubbling. remove the pie from the oven + allow it to stand in the springform pan for 15 minutes. then, carefully run a knife along the edge of the pan to loosen the pie. remove the sides of the springform pan, then slice, serve with extra sauce on the side, + garnish with parsley, if desired. Pasta pie!?!?! This is GENIUS!! YUM! This looks amazing! I love this and it sounds great. I love how the noodles are lined up! What a fun presentation Amy, I love this! Pasta is the perfect comfort food for the cooler fall weather we’ve been having here. Oh my goodness, shut the front door! This is the coolest! Would love to try this with the kids! Genius…just genius! Amy, this is too cool! Such a scrumptious and creative recipe. I’ve gotta try it, if only just to see if it would come out looking so stinkin’ PERFECT! I am in love!!! This has to be the most beautiful Italian dish I have ever seen! I am for sure going to make this one night! This looks fabulous. A new take on Timbale. I am going to try it with some green peas inside too for Christmas. Delicious! You are a genius turning pasta into a pie! And it looks so good too. i can’t get over how gorgeous this is! It looks tooooo beautiful to eat!!!!!! Wow! This is one gorgeous pie. The only paste pie I have ever had was spaghetti pie. I can’t wait to try this recipe. Hi Amy, I generally skip pasta dishes as they look so boring. This is an absolute work of art though. Can’t believe how much effort you’ve put into it. Amy- I made this for Christmas Eve Dinner and it was a HUGE success! Everyone loved it! Where yours was much prettier than mine. (I told them I only care what my food looks like when I am going to blog it) it was still so very Delish! Yay, I’m so happy to hear that, Chandra! I’m sure yours was just gorgeous + I’m thrilled that it was a huge success! I love this recipe turned out picture perfect. But….fresh ingredients are the key instead of dried. It was kinda tasteless with dried spices. Add fresh garlic, basil, oregano and parsley. So much tastier. Did a Mexican recipe just like this and it was the bomb. Is it absolutely necessary to use a spring form pan? Hi Viva, a springform pan is NOT absolutely necessary — it just makes getting the slices out / serving it a lot easier. You could really use any 9″ circular pan for the same result. You’ll still let it cool for 15 minutes or so in the pan, still run a knife along the edges. Then, you can serve it either straight out of that pan (getting that first slice out may be a bit of a challenge, but you can do it! ), or you can gently transfer the whole pie to another plate to more easily cut/serve.